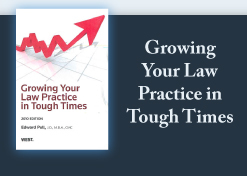 In a recent Tips column I discussed the challenging problem of how lawyers who charge a contingency fee as a flat percentage of the value recovered for the client in a given matter can cover their expenses in that matter until the value is in fact realized through verdict or settlement. The column drew a positive response from another legal consultant, who asked my opinion on whether a lawyer charging contingency fees should advance the costs for essential case management activities like expert witness fees, depositions and filing fees. Such costs can add up quickly, and if the lawyer is not successful in the case and no value is recovered, getting the client to pay the out of pocket costs can be difficult at best. My opinion is that it is better for the client, rather than the lawyer, to advance the costs. Ideally this should be specified in the engagement agreement, but too many lawyers either don't want to ask this of the client or get clients who can't afford to pay except out of the recovery that the lawyer secures. It is valid to ask why any lawyer would accept such a client, but there are a variety of reasons for doing so. The lawyer may simply need the work, even with the risk of having to advance costs, or may be convinced that a substantial recovery is possible. In such situations, the important considerations are the size and complexity of the case, the amount that needs to be advanced, and the cash reserves that the lawyer has at hand. Providing in an engagement agreement that the client is responsible for expenses need not preclude accepting a case from a client who has limited means to pay. While lawyers tend not to enforce such provisions during the representation, on settlement or judgment, they often reduce the client's share by the expenses advanced on behalf of the client when stipulated in the engagement agreement. Note that it is not possible to change an engagement agreement once both parties have signed, so if you've not stipulated payment of expenses up front it's too late to add such a provision retroactively. If the client who has promised to pay expenses while the case is ongoing cannot or will not do so, Rule of Professional Conduct 1.16 allows the lawyer to withdraw from the case as long as the client has been given adequate warning and the withdrawal does not come too close to a court date. However, withdrawing without adequate communication on and careful records of the client's conduct may bring a state bar disciplinary action, and must be done carefully. The best course remains to choose your contingency cases and clients carefully. This is the week of peace, joy and goodwill. Ever wonder why it's only for a week? Please accept our best wishes for a very happy and healthy holiday... and a great new year!